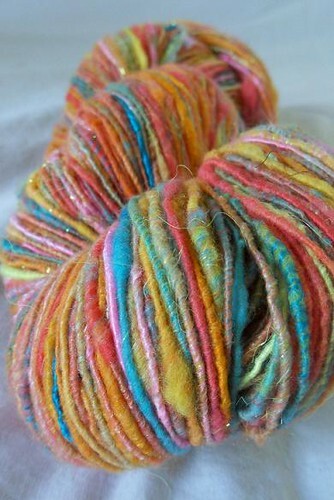 This is the Handspun & Handcrafts Swap!! This swap will pair up spinners and non-spinners (hereafter referred to as crafters, not because spinners are not crafters, but to keep things simple), to swap handspun and other crafts with each other. Spinners will make beautiful yarn for their partners and Crafters will make beautiful crafts for their partners. Please discuss with your partner to determine level of effort: as a general guideline, spinners will make a skein of yarn for their partner, and crafters will make one large and 2 small items for their partner (of course, both a "skein" and a "large/small item" are really relative terms, which is why you need to communicate with your partner). You can do more than this of course if you both agree to do so. You will sign up either as a Spinner OR a Crafter, please use the appropriate questionnaire below. If more crafters than spinners sign up, the swap will be limited to the number of spinners (and vice-versa). Participants will be taken on a first-come, first-served basis (sign up early!). I am anticipating that there will be more crafters sign up than spinners. Therefore, spinners who have successfully completed at least one swap may choose to take two partners if desired, and crafters will be limited to one partner, to ensure that more people get a chance to participate. Would you be willing to ship to an address outside of your country? What kind of yarn do you spin? What kind of fibers do you use? What kind of crafted items would you like to receive? Any allergies your partner should know about? What kind of yarn do you like to use? What kind of fibers do you like? What kind of crafts can you do/what can you make for your partner? I'm #1! Hell yeah I'm in on this. I was just at Hobby Lobby yesterday trying to figure out how to spend me gift cards and I was thinking "Man, I wish I was in a swap so I had real projects to plan around my $ spending." And now I do! Well, kind of. I guess this isn't really too much of a HL friendly swap, though. Whatever! I'm in! jexxican...I'm in the same boat you're in, but I'll up you one. I have extra time b/c I just had surgery, so I'll be home for a few weeks, and I have extra money in the form of a Michael's gift card that I can't spend till I feel up to going out of the house for any length of time. I am excited for this swap though! yay! I'm sooo in for this! sending my questionnaire asap! ooo I want to do this one! I'm trying to spin more this year so this would be good. Sending in my questionnaire now. Bah I'm tempted....I think I'll be stalking and see how school/work is going closer to the sign up end date. I would like to join this swap, but I'm going to throw it out there to the group before I go ahead and do it. The thing is, I only have drop-spindles, and I really like to spin but I'm not so great at it yet, and I end up with smallish uneven skeins. But I have heard some people say that they really like the less experienced "art yarn" type quality- and I also make my own batts and have tons of different fiber available to mix in. So if anyone is wanting to receive some smaller chunky random yarns- let me know and I will definitely join. Otherwise I will hold off and my feelings won't be hurt a bit. It's like torture for me to keep checking the swap boards. I'm about to enter into my final semester of college, in which one of my classes is my senior project, aka, my solo show. It's going to be soooo time consuming and I don't want to flake. But, man, I'd be all over this like white on rice! I guess I'll just have to stalk and be envious! So tempted. I'm supposed to be taking a swap break, which I'm not good at, and I told the bf that I wouldn't sign up for more than one at a time. But the one I'm signed up for now is a OTT, so I'll probably be done with that before sign ups for this even close. Hmmmm.